Thyme is a delightful addition to many recipes, but extract thyme oil from this flavourful and common herb and you have a powerful remedy with many medicinal uses. This is something the ancient Greeks, Romans and Egyptians all understood all too well and used this extract as an incense, a salve and an embalming agent. The oil is generally extracted from the flowers and the leaves of common thyme by a steaming process. This is the variety you would most commonly use in your cooking. Read more about this variety. This extract has a light amber or red-brown colour, with a sweet herbal smell. 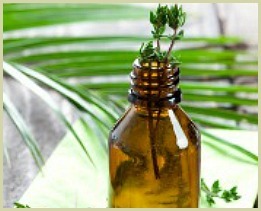 And as it contains thymol, a powerful antiseptic, thyme oil is an effective remedy for a whole range of ailments. Before the discovery of antibiotics, doctors soaked bandages in it to kill germs and help heal wounds. It also has anti-fungal and anti-bacterial uses and is found in a whole range of products; mouthwash, toothpaste and anti-bacterial hand gels to name just a few. Please Note: The oil can be quite strong and should be avoided during pregnancy or if you have high blood pressure. As always, seek medical advice before using. Even though the oil has many uses, the thyme plant itself is full of many healthy benefits, and a tea infusion made of fresh or dried leaves is an effective treatment for mouth infections and sore throats. If using it for a sore throat or mouth infection you let the tea cool before gargling it or using as a mouthwash. Click here for a thyme tea recipe (it's my own). Very tasty and quick to make. Even when I'm not ill, I sometimes enjoy a cup just for its many health benefits. If you are interested in using it to make a drink, or just general use in your home cooking, then growing the herb is an excellent idea. It is fairly easy, and it will ensure a fresh, healthy supply all year round. Click here for info on growing the herb.